Yesterday morning I woke up with the stiffest neck of all time. From the second I pulled my head off of my pillow I knew I was in for some trouble. There was no turning my neck to the left at all. Taking a quick glance at the mirror I even laughed at the way I looked. Over the past couple of days I have been spending quite a bit of time looking at a computer screen and this is probably to blame for it. Too much sitting in one place and not moving around set me up for this discomfort. For the rest of the day I couldn’t really do anything. Today when I woke up it was not as bad but it still hurt. There was no way I could not do some sort of workout today. Debating about what to do I knew it had to be something which did not use a pull up bar or dumbbells. Using either or those could result in me hurting my neck even more than it already was. It was going to be Yoga today. It had been a month since I had last done Yoga. I do not know why I took such a long break from doing it but I was do. Hopefully by doing Yoga it would stretch out all of the muscles that were cramping up my neck. While doing Yoga all of the bones and joints in my body started popping. This is not uncommon for me but this time it was much louder. At some points it was almost painful. My balance was way off and so was my Yoga strength. At the end of the workout I did feel much better and most of the pain in my neck had gone away. I felt that much better after doing Yoga I decided to get on the treadmill and run 3 miles. It was a good workout for me and my body needed it. 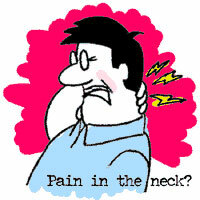 Too much sitting at a desk put a serious kink in my neck. Its slowly going away and hopefully tomorrow I’ll be able to do a P90X DVD tomorrow. Maybe I need to get one of those specialized sleeping pillows or those funny look things for your neck that looks like a horseshoe.